Arrival in Athens International Airport El. Venizelos.Meet and assist by our staff and transfer to Hotel in Athens.Time for leisure. In the evening meet at the lobby of the Hotel with our representative in order to join a night tour in the City of Athens with folklore show and dinner. luxury of our buses.Afterward, you will enjoy your dinner watching a folklore show with live famous bouzouki music and Greek dances. Meet with our representative in order to join a city tour of Athens city with Acropolis and the Archeological Museum. This tour emphasizes the artistic and cultural side of Athens. During the City tour, our guide will explain the important exhibits of all major museums you pass by. Also, you will enjoy a better view of the modern side of the city just before visiting one of the Seven Wonders of the World “Acropolis”. After the guided tour of Acropolis just outside the Parthenon we will drive you to the National Archaeological Museum for a visit. Later you will see in the daylight all the major sites of Athens. In the afternoon transfer to the Hotel. Time free. One day cruise to three of the most beautiful islands of the Saronic Gulf (Aegina – Poros – Hydra ). Lunch and transfers are included. 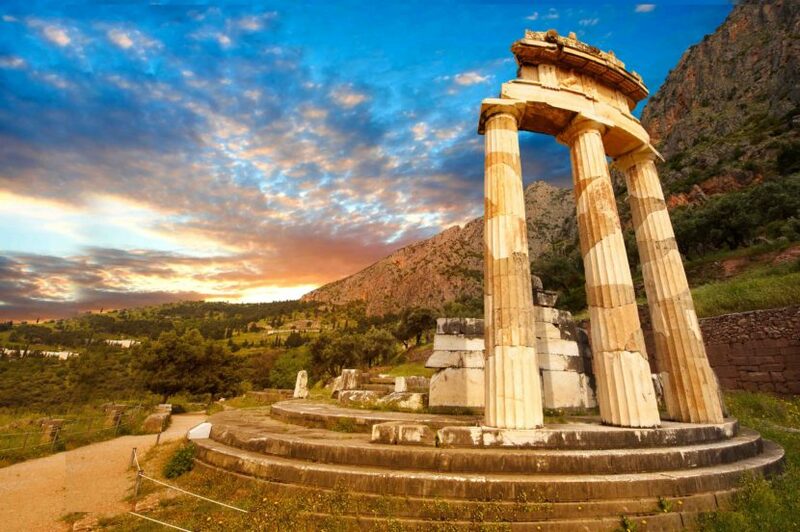 Visit of Delphi “the Navel of Earth”, the archaeological site, the Temple of Apollo, the Museum, the “Castalia spring” with the two monumental fountains receiving water from the spring for the last 3000 years. In our way to the Airport and according to flights schedule, visit the Olympic Games Installations.